lol 21 questions. Will it come in pink? Is it gonna shoot the best cat video? Sorry lol, No pink, but you can get a pink camera bag and dye your cat pink. We used to have a pink poddle near us that you could see from the 101 Freeway. Yes, it will shoot the best cat video, if you put it in stealth mode. Will the new included software burn 4k to the new BlueRay format disc? Stacked m43 sensor with further reduced resolution (around 10-12k), fully oriented to video. I think Sony has sent everyone back to the drawing boards with it's latest releases, but I still think there are areas that can be improved on. Modular and stackable as a cohesive unit, not so much of a kludge the YAGH brick is, even though I think the brick had the right idea. SDI, USB3, HDMI, XLR jacks, Battery Pack, Raw or at least10 bit SSD VideoRecorder, LANC, wifi router with antenna for streaming/monitoring etc,... These add ons can be stacked or not used at all if you want to go light. I should do a 3D render mockup of what i have in my head here. I think it would look fantastic. 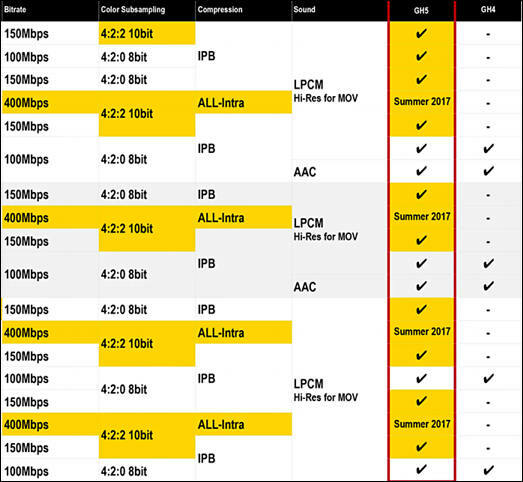 New sensor tech with 2.0 crop or better for every resolution. I really miss the 1.8# crop of the GH2. Sony has put the things difficult for other manufacturers after A7S and A7RII (we make the idea that A7SII would be something extraordinary), although I have a GH2 and GX7 (two great cameras), with the budget would pass the GH4 and go to the A7S; Full Frame sensor, S-Log 2, stratospheric sensitivity what very nice for my night still. 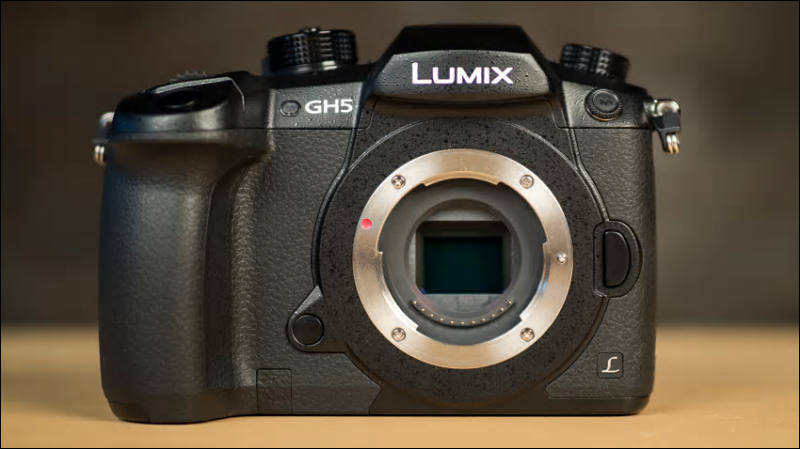 Panasonic need make some very spectacular with GH5, Panasonic require an argument to continue to maintain their buyers happy as it has done in the past. Although Panasonic seem to hear the consumer lately. The most important feature will be 4k 60P. No new Sony has it. No one mentioned vlog as a speculation, eh? Maybe I have more faith in Panasonic than most. After seeing the advances they made from GH3 to 4, I would expect nothing less for a GH5. I also have a A7s that I only use in poor/low light beyond the GH4 capabilities, and I have use a 4k recorder DownRes to get better Video in that light. Really clean 6400 ISO would press the buy button for me. The AF while shooting Video and the unlimited internal recording are already way better features on the GH4. @Vesku I agree about 4K/60P. V-log is probably also a given in the spec. 10 bit internal would be a huge differentiator vs. the competition if they can deliver. I'd love to see an S35 sensor crammed into the MFT mount, if anything just to shut up the "small sensor" Nazis. That feature is probably less than 50%, unless they decide to share sensor production with the Varicam to boost production numbers and lower fab costs. I hear all this "Sony has put everyone on notice/no one can keep up/blah, blah, blah." Panasonic did it first with the GH4. It is everything you need in a video/stills hybrid. It's not good in very low light, it's autofocus (especially in 4K) needs to be better, but it was revolutionary and is still a phenomenal camera. The NX1 was nice, had some new things, but I wouldn't say it was revolutionary. Same for the A7S from Sony. Certainly its low light was revolutionary (it is amazing) but overall, it wasn't anything that blew the competition away. If it would have had 4K internal, it would have been a stronger contender for replacing the GH4 in my bag. Now, Sony has made the next big advance, but to think Panasonic will be left in the dust is a pretty brave assumption to make, IMO. They did it once, and I'm betting on them making another serious push to be considered the best DSLR form video/stills hybrid. First, the GHs were always hybrid cameras, not video-only cameras - and I guess that Panasonic will continue in this trend, trying to sell it both for photo and video crowds. This discards, at the start, a low resolution sensor like the A7S's - in fact, since it will probably (like the GH4) use one same sensor from other stills cameras, a higher resolution sensor will probably be used (18mp or 20mp), because is now the trend in the stills camp. I guess that both Olympus and Panasonic are waiting for a new sensor becoming available for both the GH5 and the E-M1 Mark II sensor (the E-M1 uses a Panasonic sensor), with some improvement that could get headlines. Probably a BSI (not stacked) one. I'm just hoping it has more DR. 13 Stops and I'll mot likely buy it. Low light capability could be better, add one more useable stop and I'd buy the GH5 for sure. The A7s was primarily built for low light Video. I would like to see the same emphasis with the GH5. Plenty of buyers will use it for Stills anyway, even if it gets a 12 MP s35 Sensor. I'd like 10 bit, 4:2:2 DCI color space support (internally and RAW video externally), a global shutter with no jello, and much better dynamic range and low light capability. At least 60 fps UHD. If Fuji/Panasonic are then ready the organic sensor, that could be memorable. Global shutter, in-body stabilization, clean usable footage noise free at 12800 (Sony does twice as much). 2016 will be about 8k. Facts tell us that it won't. 2016 will be about camera companies mergers and deaths. This is for sure. I've just sold my GH3 and I have no idea what to do !!!! Buy the new A7R II ? If you now have no camera but a bunch of MFT lens get the GH4. It is better in every way. You can use a SpeedBooster in low light. The A7rII does cost twice as much, the equivalent lens are heavier and more expensive, battery life is dismal, and recording is limited to "up to" 29 minutes. Another (better) option would be to get the JVC LS300 (s35 Sensor) CamCorder if you are into Video. The Stills comparison does not matter to me, because they are all "good enough" for my work.